A sea sapphire in motion. A tiny iridescent copepod (Sapphirina copepod) has been making its way around the web lately in a lovely now-you-see-it, now-you-don’t fashion not unlike its appearance in the natural habitat. Invisible unless hit at the right angle by light, they are described by those who have seen them as making the water look like its been scattered with jewels. 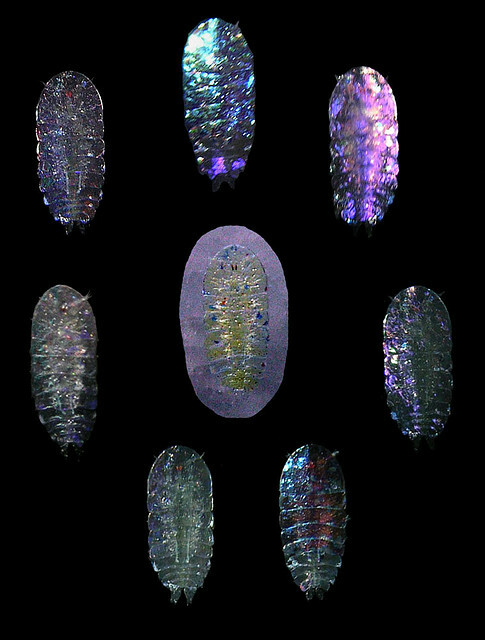 Researcher RR Helm, who wrote a wonderful piece on these creatures in Deep Sea News, has dubbed them ‘sea sapphires’. A lot of the time I feel like I’m looking out over vast expanses of space where the news is all pretty much the same, most of it not good, and then there’s a flicker, or maybe two, of something that is worth celebrating. And not just RR Helm‘s lovely writing. For example, there’s good news on one of my pet topics, the American eel: The annual season for harvesting valuable eel young, the elvers, will soon be upon us. Concern about steep declines in the American eel population has prompted the The Atlantic States Marine Fisheries Commission to issue strict catch limits being placed on the elver harvest this year, with the overall permitted catch down 35% from last year, when there were no restrictions. I won’t go on at length about the complex role of the American eel in the Atlantic ecosystem, how the debate over elver harvesting reflects a number of state vs. tribal conservation conflicts, nor about how little is known about the eel and the status of its population, nor how these juvenile eels are caught to be sold halfway around the world because Asian eel stocks are utterly depleted. The fact is, a catch quota is a good start to slowing down the overfishing of these animals while their actual status is still under examination. And so there’s a flash of color, of positive news, in the sea. The hope that if I keep watching, I’ll always see more. Maybe even an entire sea of jewelled water. 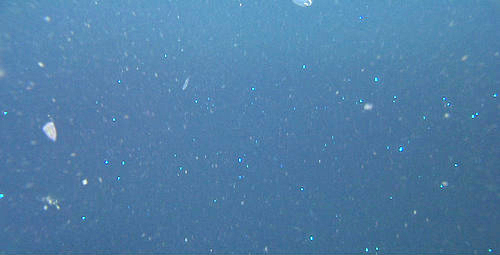 ROV frame grab of the sparkling layer of Sapphirina copepods at about 40 meters (130 feet).